What will you find at Hekate’s crossroads? Over the past few decades, I’ve been fascinated to watch the worlds of psychics and metaphysics move closer to each other. Then neuroscience began to come to the forefront and reinforce some of the most treasured foundations of the intuitive arts. It, therefore, came as no surprise when David Salisbury documented the meeting of Craft practices with activist practices. What makes this book unique is Salisbury’s credible experience in both worlds (he calls that lifestyles that require the entirety of who we are) and his ability to communicate the connections between the two. For readers who are looking for power in either or both worlds, he lets you know that the work is messy, frustrating, and often met with failure. The necessary skill to do this work is resilience. The book begins with a thorough manual for activism (including self-protection in the physical world). 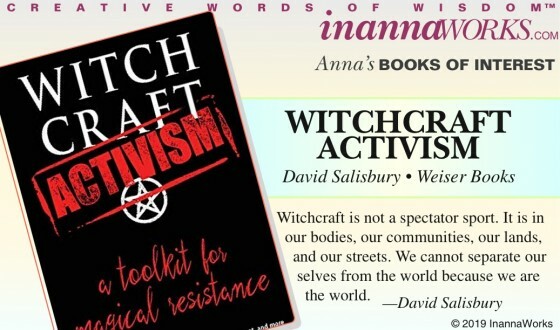 He continues with a spell and ritual overview to help readers incorporate other worldly techniques into their social activism. The book concludes with a history of modern magical activism, citing the likes of Dion Fortune’s magical visualizations, distributed to members of her Fraternity of the Inner Light, to repel Hitler and the Nazis during World War II. This is a timely addition to the science of social change by an author who practices what he preaches. SHOP FOR THE BOOK. This entry was posted in Anna's Books of Interest, Red Wheel/Weiser. Bookmark the permalink.